There are new challenges for yachts that want to sail to Russia. 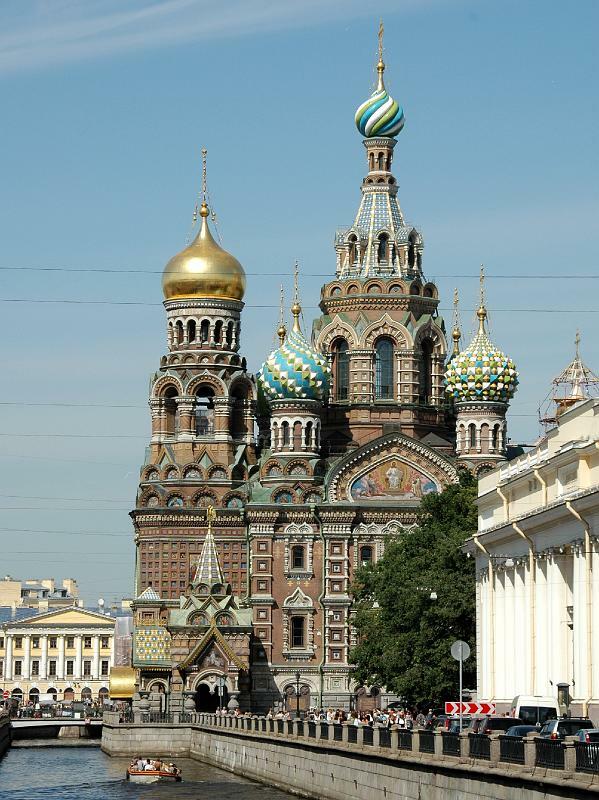 There are three Russian Baltic ports, and St. Petersburg is by far the easiest and most interesting to visit. Vyborg is further north right on the border with Finland, and Kaliningrad is a small piece of Russian property between Lithuania and Poland. 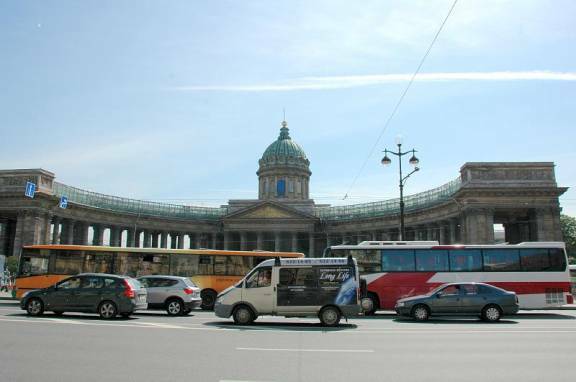 St. Petersburg is of historical importance, has magnificent museums, cathedrals and parks, but most important, it is the city where Vladimir Ivankiv lives. Vladimir is an agent who represents visiting yachts folk and assists with customs & immigration, interfaces with the Central River Yacht Club and is a registered tour guide. Without proficiency in Russian and the Cyrillic alphabet and the ever-changing rules and regulations, making the trip without Vladimir’s assistance would be fraught with difficulties. We are glad we could sail Pilgrim to St. Petersburg and are grateful to Vladimir for his knowledge, enthusiasm and patience. Russian authorities want to be informed of your entrance into their territory, and want you to follow specific shipping routes once in the country. 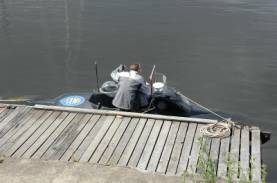 Vladimir had informed the authorities of our plans 24 hours before we entered Russia from Haapasaari, Finland. 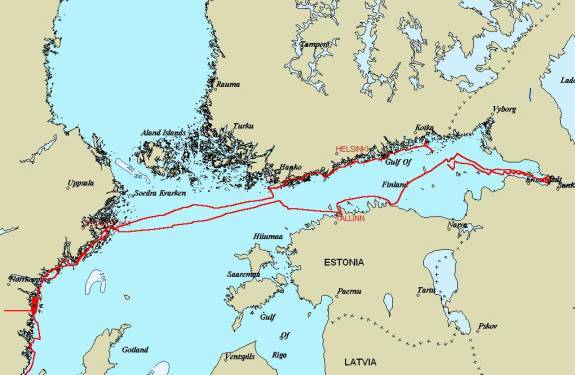 The straight-line route from Haapasaari to St. Petersburg is 95, an overnight sail for most boats. With 15 knots of wind from the east and shipping routes heading mainly east, we had a tight zigzag route tacking across the shipping lanes, avoiding military no-go zones and sandy shoals. We went 142 miles, and took 27 hours to get to St. Petersburg. There was a steady stream of cargo ships and Russian coast guard vessels watching our seemingly chaotic progress to St. Petersburg. We called the coast guard when we crossed into Russian water and had no response. They subsequently called us twice to get our location, course and speed, especially when we were sailing due north in our effort to go east to St. Petersburg. 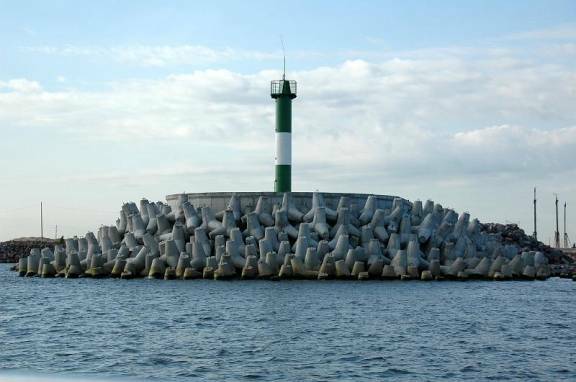 There is a floodgate that surrounds St. Petersburg / Neva River Delta about 15 miles out. There is one opening for all boats to pass through. Our chart indicated an obsolete opening. We figured out where the opening was when we saw AIS signals from cargo ships going right through what appeared to be solid land. Inside the floodgate, the water is very shallow and has buoyed channels that MUST be followed. We cannot imagine how sailing is done here. Some channels are up to 40 feet deep (for cruise liners and cargo ships), but most are 10-15 feet deep for the hydrofoil ferries, barges and pleasure yachts. 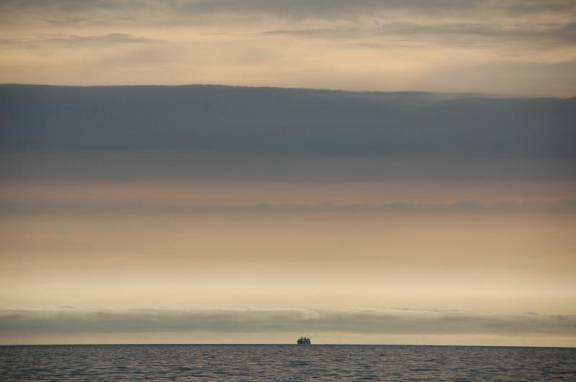 As we arrived we saw many of the Volvo Ocean Race boats leaving St. Petersburg, having just completed the leg of the race that ended there. Vladimir met us at the Customs & Immigration dock and helped us clear in. 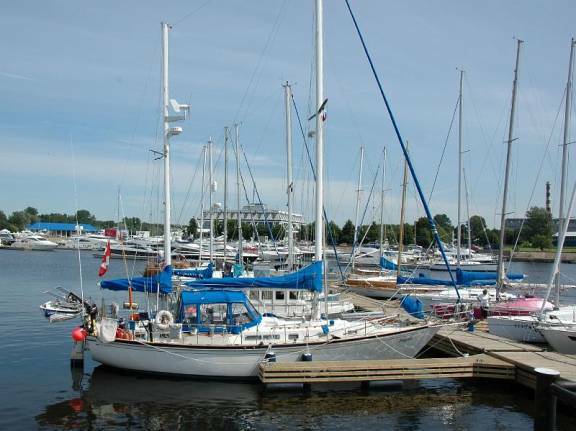 The trip to Central River Yacht Club, about 2 miles from the Customs dock as the crow flies, is more than 7 miles through buoyed channels. We were greeted at our dock by Vladimir, the harbour master, and the Canadian flag flying at the clubhouse. One of the advantages of sailing your own boat to St. Petersburg is that you do not have hotel expenses (marina expenses for us were 30€ / night), and can prepare meals onboard reducing restaurant expenses. This also meant we had to find grocery stores. The western-style supermarket hardly exists. Instead there are large convenience stores and buildings that house many stalls each specializing in fish, meat, vegetables & fruit, beans, rice & nuts, bread, or non-food items. In the one western-style grocery store we found open bins in the freezer with vegetables, berries, and the Russian equivalent of little ravioli / perogie style pasta stuffed with meat, sausage or potato. You just scooped out as much as you wanted and have the bag weighed. In the large stores there are no-charge lockers in which you must put your large bundles (backpack, bags, etc.) before entering the store. 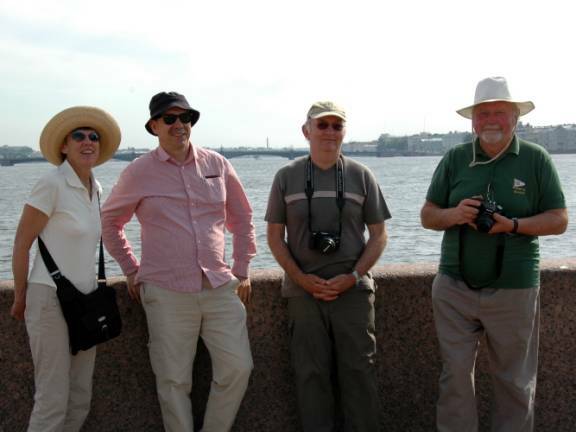 Needless to say, we visited many of the major tourist attractions: The Hermitage, The Summer Palace and Gardens at Peterhof, the Peter and Paul Fortress, the Russian Museum, Cathedrals (St. Isaac’s, Nicholas, Kazan, Spilled Blood) and the Grand Choral Synagogue, parks and countless bridges over the rivers and canals. We also attended a ballet performance of Don Quixote at the Mariinsky Theatre. 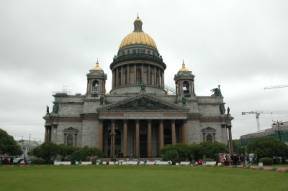 You can find so many fine books and websites with excellent photos of these attractions and the highlights of the museum contents, we have minimized our photos of these and concentrated of our impressions / opinions of St. Petersburg and some of our favorite photos from the great sites. This city is so expansive and colourful. The scale is huge. The streets are wide, squares and parks are grand, and just getting round takes much walking energy. 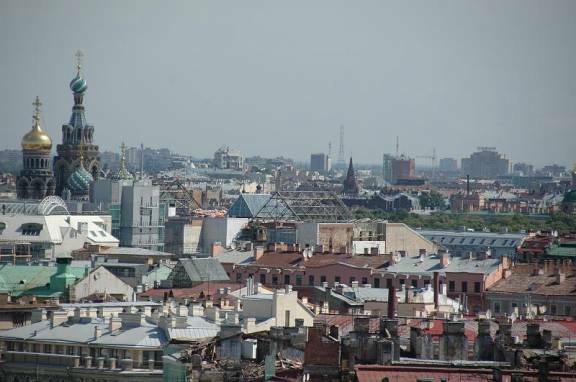 It is a relatively modern city that was planned as the capital by Peter the Great in the early 1700’s. 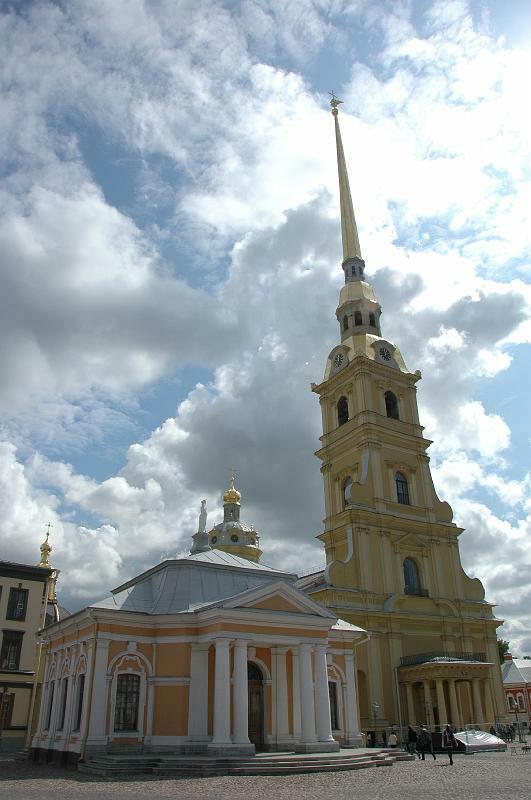 The city is built on the delta of the Neva River and its tributaries, which required the draining of the swampy delta. The ground is therefore somewhat soft. Most of the buildings are brick with a stucco-like façade. 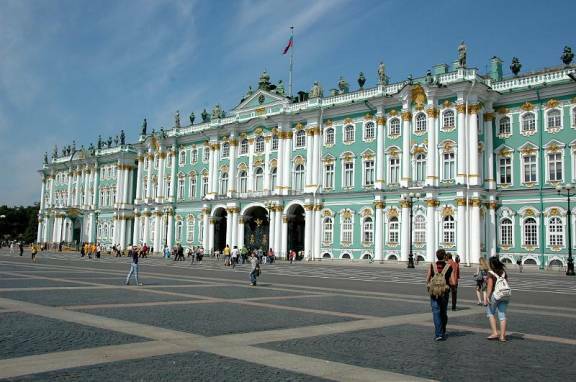 These façades are then painted to resemble stone; yellow, blue, and red in varying shades are most common, but some, like the Winter Palace are vivid green. 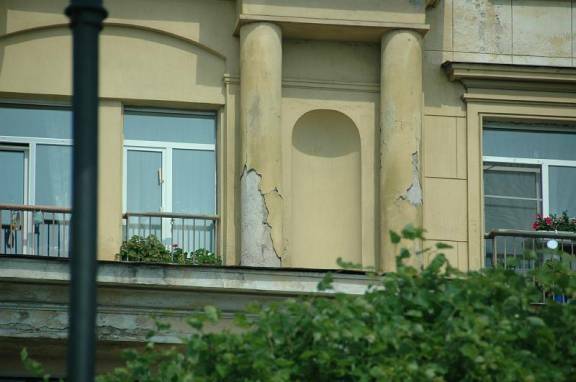 The major tourist attractions are kept in reasonably good condition, but we noticed the walls on courtyards that were not open to the public were in poor condition and paint was often peeling off window woodwork. 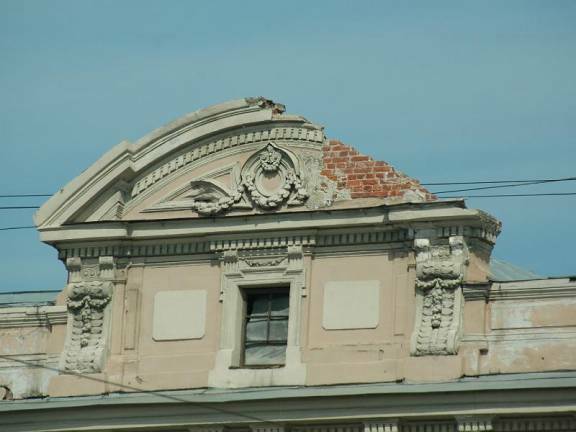 Buildings constructed during the Soviet era are not well maintained and are not mentioned in tour guides. In addition to the natural rivers, many canals have been dug. 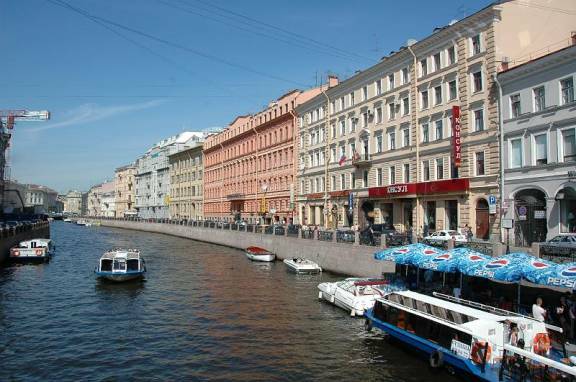 Peter the Great spent time in Amsterdam and brought the canal idea back to Russia. Early on there were few bridges and Peter though everyone should learn how to sail to get around the city. Now there are many bridges for both traffic and pedestrians. The bridges, many that open, are a feature of the city. 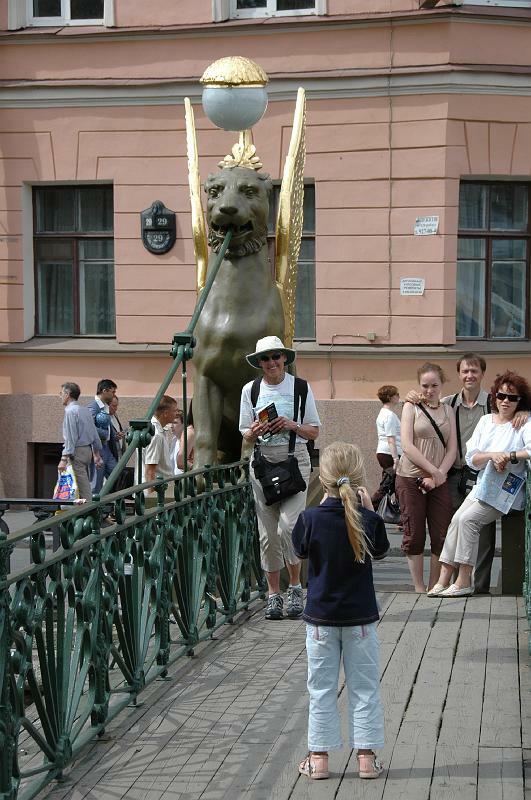 Some of them are quite delightful with lions or gargoyles holding suspension wires in their mouths. 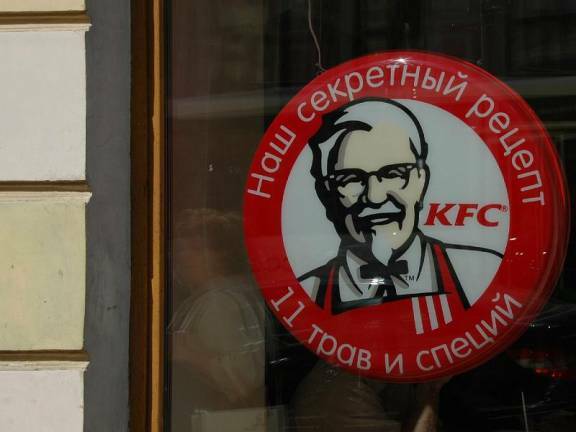 The Cyrillic alphabet makes getting around a challenge. 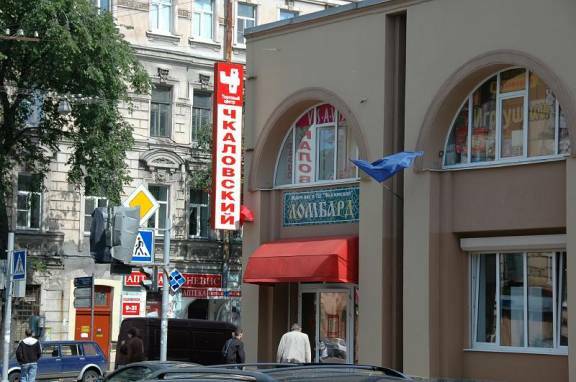 Guide books in English use the Roman alphabet to name sites, but the street signs are in Cyrillic. Fortunately numerals do not change from language to language and alphabet to alphabet, but few buildings had an address sign. After two weeks, we had the hang of it, but the first day was a challenge. 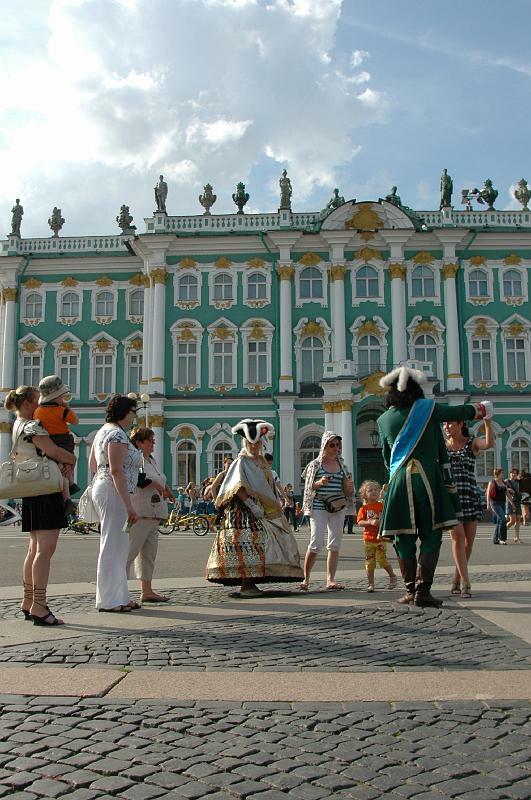 At virtually every tourist site, there are people dressed in 18th century costumes who will relieve you of a few rubles to have your picture taken with them. At the Cathedral of our Saviour on Spilled Blood we saw folks with dressed-up monkeys offering a unique photo-op for a fee. There are also horse drawn carriages to take you on a tour. The women are usually dressed in fashionable clothes with spiky high heels and coloured, coiffed hair and make up even when they are on boats. The streets are filled with military men (few women) either in camouflage fatigues or full dress, including very wide-brimmed hats. The rank determines how wide the hat brim is. In a society where wealth and class were technically eliminated, rank in the bureaucracy (and the uniform that accompanies it) indicates the importance of the person. 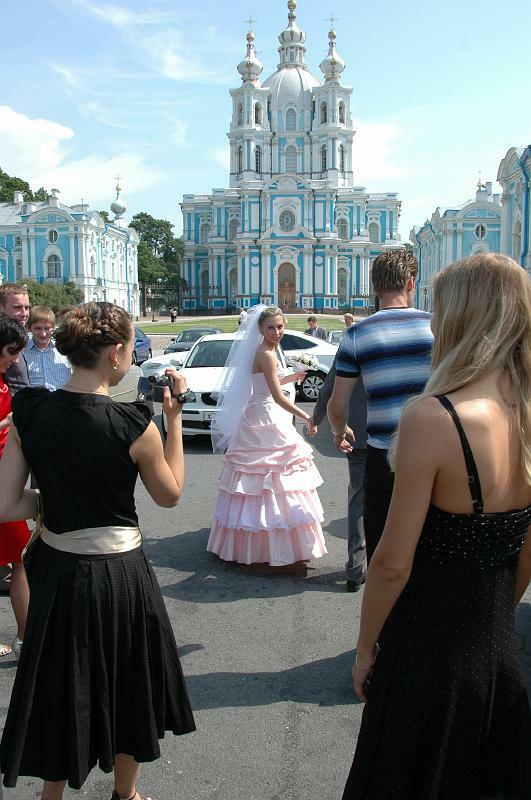 We saw many wedding parties, usually consisting of young people only making the rounds of the important cathedral and museum sites for photographs. The brides are in elegant bridal gowns, the grooms usually in suits often with a mobile phone at their ear. Most of the brides appear anorexic to us, and evidently being very skinny is highly valued in Russian young women. Now that more churches and cathedrals are open, couples often opt for a church wedding, whether practicing or not, much as in the West. 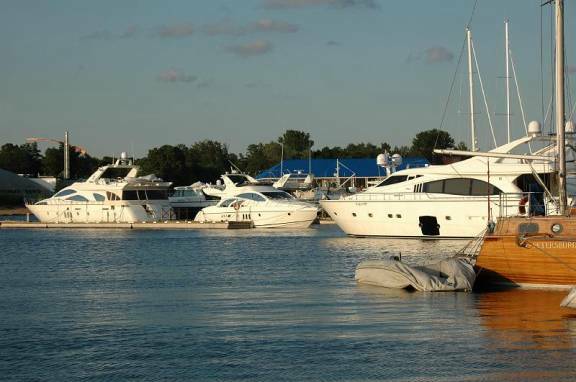 We were amazed by the 20+meter (60 foot) powerboats at the Central River Yacht Club. 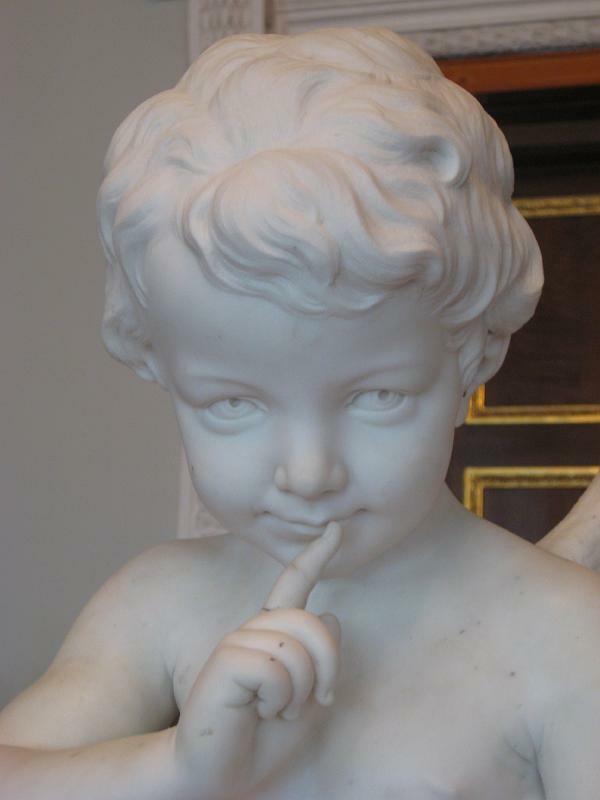 There is a noveau-rich class now and they seem unsure of how they should express their wealth. 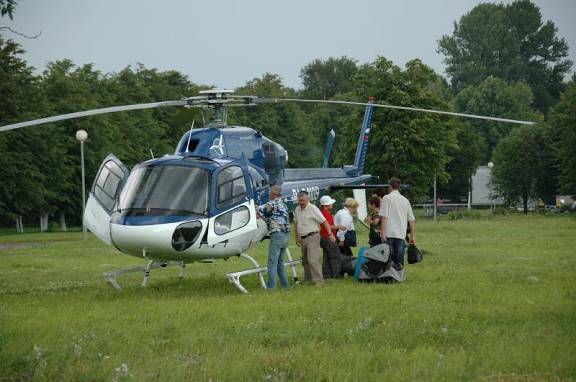 At the yacht club there is a helicopter field, and we saw at least 8 different copters land. 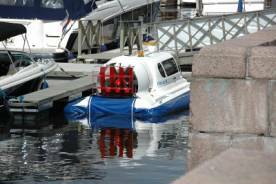 There is also a personal hovercraft and a personal submarine! 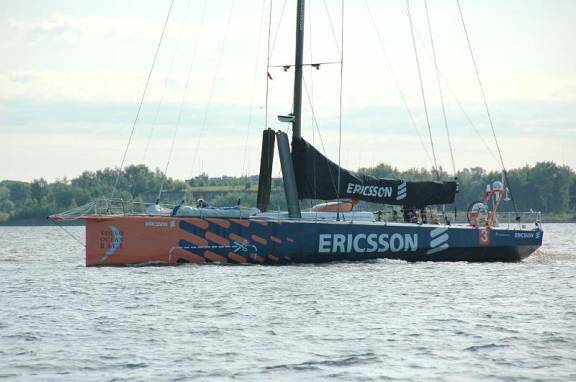 A catamaran that has a rotating mast (huge) that seems to change orientation to the wind as the wind changes, even at the dock. The ferries are hydrofoils, and there are many of them. Speaking of modes of transportation, we have been surprised at the number of US-made cars we have seen, especially Fords and Chevrolets. 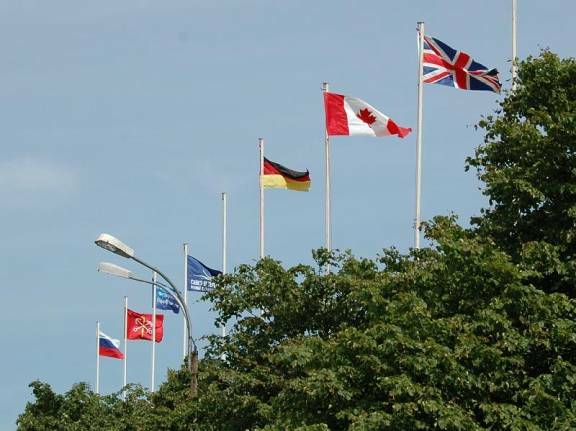 The European and Japanese cars are most popular, with plenty of Lada’s still on the road. 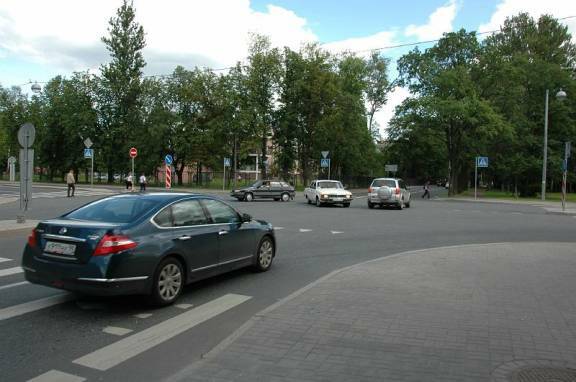 Cars are generally driven fast, and follow traffic rules when convenient. Pedestrians must take great care, even when in crosswalks or crossing with traffic signals. On the yacht club grounds there are several interesting/strange buildings. The Nobel House used to be the clubhouse in the 1980’s before the new clubhouse was built for the Olympics (but Tallinn/Parita won the Olympics). It was a holiday house for the Nobel family (of Sweden, Nobel-Prize family, that is). It stands in ruins today. 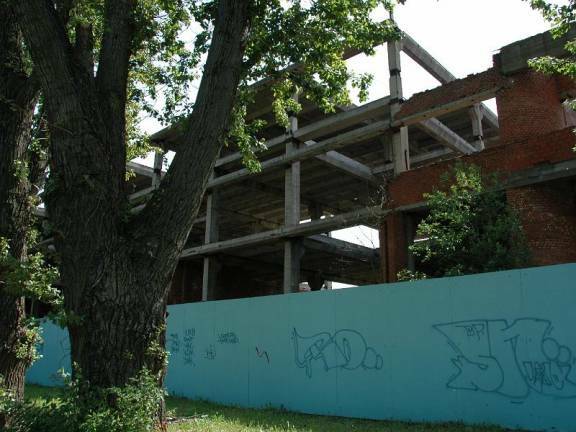 There is also a brick and concrete framed factory that was never completed and stands behind hoardings crumbing to the ravages of time. It was supposed to be a factory to build small pleasure craft, but the venture never got off the ground, even with Perestroika. Our departure from St. Petersburg started in easterly winds, allowing us a bit of sailing, then died to nothing, requiring motoring and swarms of tiny gnats in the cockpit. By early evening the dreaded westerly wind with rain hit us and we motor-sailed through the night and arrived in Vergi, Estonia 145 miles and 26 hours after leaving St. Petersburg. 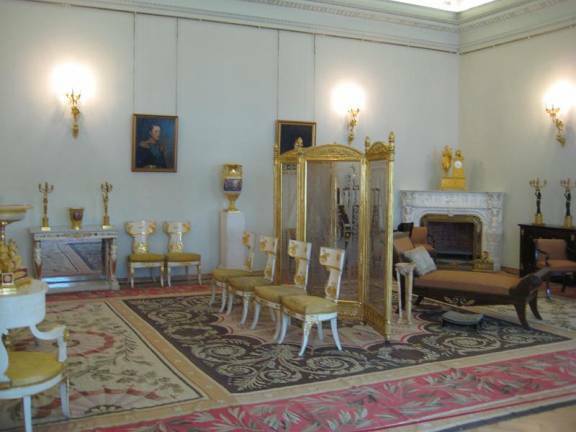 The Hermitage / Winter Palace. 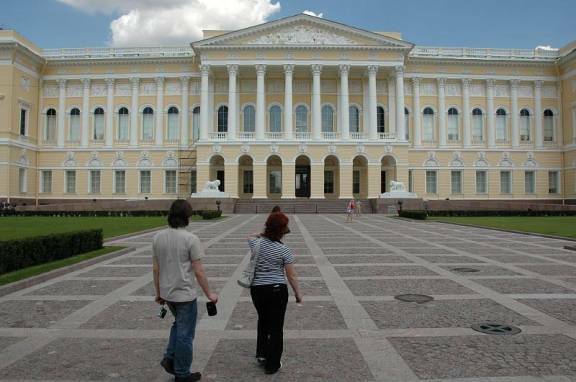 The Hermitage consists of the Winter Palace (huge), the Little Hermitage (smaller, but still larger than any house I ever lived in), the Large Hermitage (about 2/3 the size of the Winter Palace, and the Hermitage Theatre. We had seen travelogues, but were blown away by the sheer size of the buildings. There is LOTS of art, some good, some mediocre, and some great. It is hard to sift the wheat from the chaff. The layout is poor, especially the signage and the lighting. There are sheer curtains on all the windows, and generally speaking the curtains were down, but enough light could get in to interfere with viewing the paintings (caused glare) and damage the paintings. It was definitely worth spending a day there, but this is not a world-class art museum. The floor plan and list of special exhibits in English were not helpful. 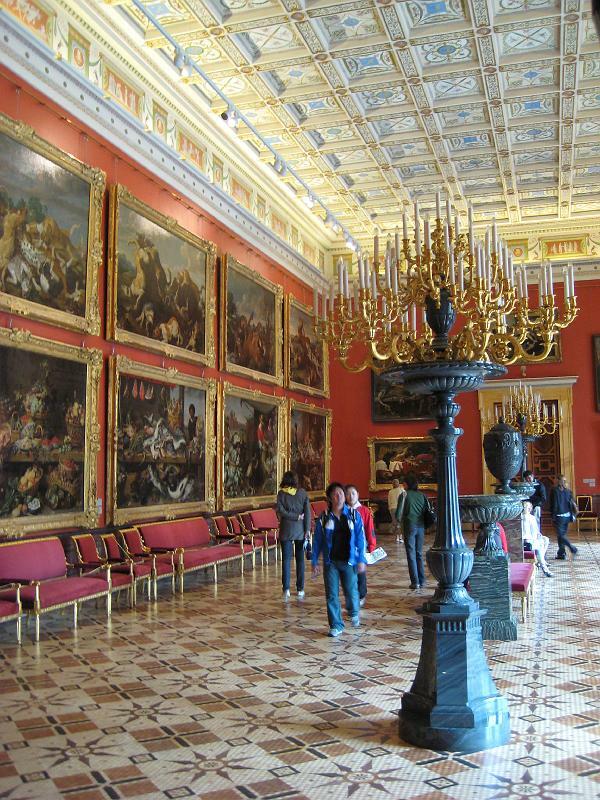 We are glad we had the Lonely Planet Guide to St. Petersburg to help us get through the museum and find the treasures. 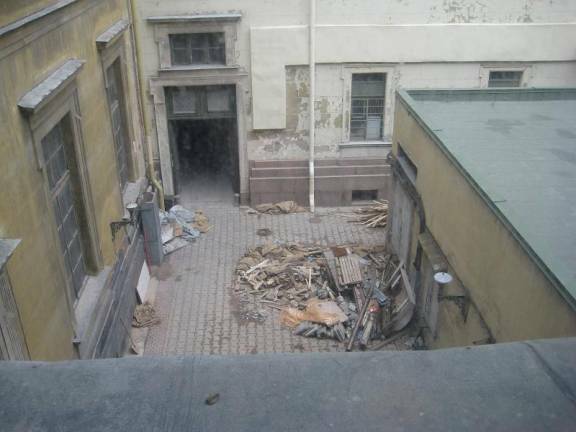 The small internal courtyards were in bad repair. Much of the woodwork around the windows is in need of scraping/ painting. We could certainly understand why a revolution took place in Russia; royalty and the upper class were over the top with lavishness and spending. Brian's comments regarding the Hermitage. Simply mind blowing, I now understand why revolutions occur. 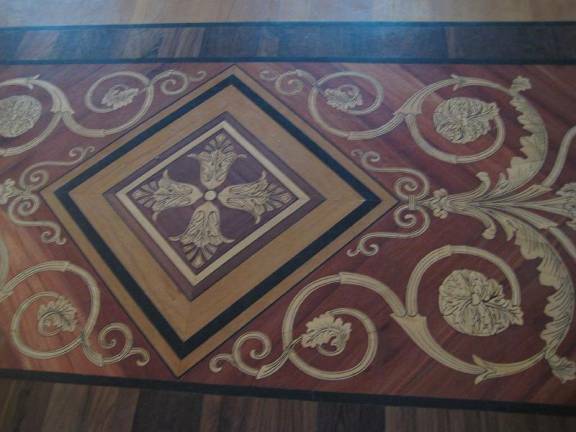 A lot of the art seems to be made to order to fill a space with a specific classical theme. In many cases the rooms are far more interesting than the contents. 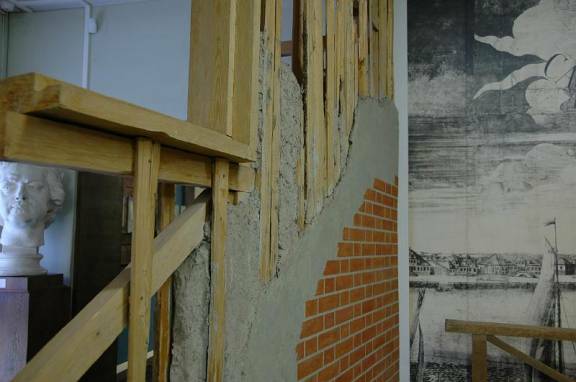 There is a lot of great art on the walls but it is sometimes hard to uncover. A great deal of money has been spent with the restoration ... a great deal more is required in basic infrastructure development ... the place was full of people ... there are 2 small cafes ... 2 small washrooms ... the lineups exceeded anything I have ever seen ... the room security/monitoring folks seem more interested in finding a good sleeping position than helping anyone. None of the exhibits outside of a few were identified. Even the Russia tags were minimal. I would recommend a visit to this site if only to see what an unlimited decorating budget and poor taste can accomplish on the grandest scale possible. 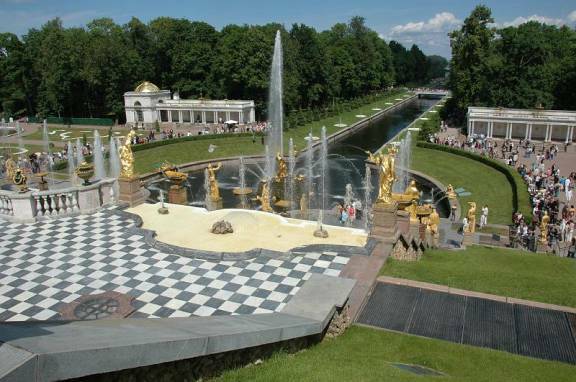 Petrodvorets (Peter’s Palace) and gardens with their many (over 100) Baroque fountains, lakes, ponds and cascades at Peterhof, 30 km outside St. Petersburg. 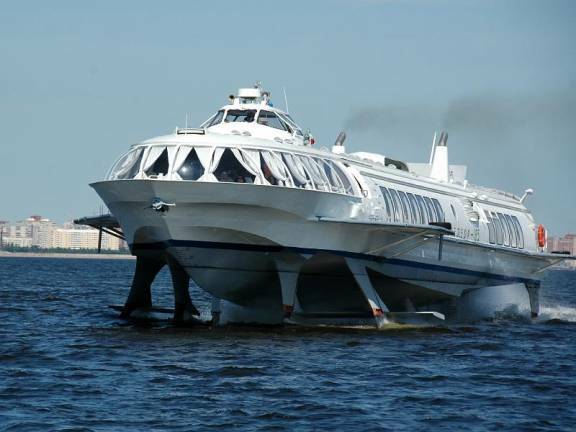 We took a hydrofoil ferry to Peterhof. 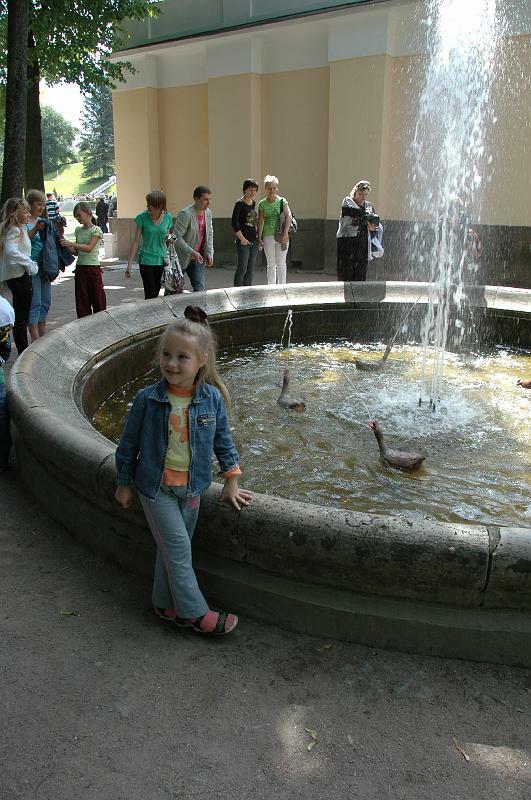 Our favorite fountain featured 4 quacking bronze ducks chased by a barking bulldog. The Commandant’s House Museum was the most interesting display featuring the history of St. Petersburg up to the mid-20th century. The cathedral (memorial / burial site, not a real house of worship) was gaudy Baroque. Many of the buildings seemed to be Disney-World painted facades. 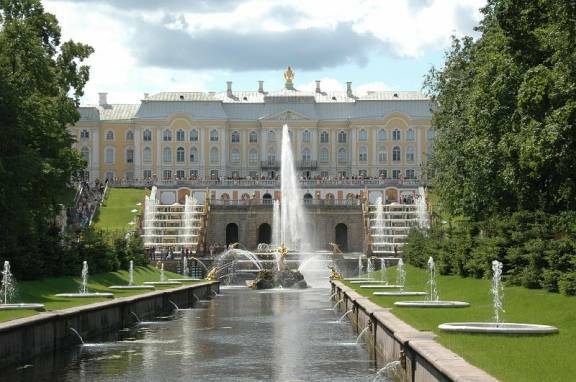 So much of St. Petersburg and Peterhof were destroyed during WW2 and have been reconstructed … brick with plaster façade, then painted (sometimes to look like bricks!). The Prison of the Tubetskoy Bastion was a series of solitary confinement cells on two floors. 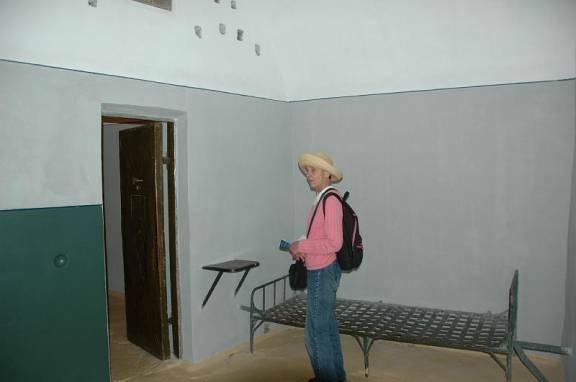 The first floor documented many of the tsarist prisoners, and the second floor documented post-revolutionary prisoners. Perhaps there were fewer prisoners during tsarist times because peasants were simply executed, not incarcerated. 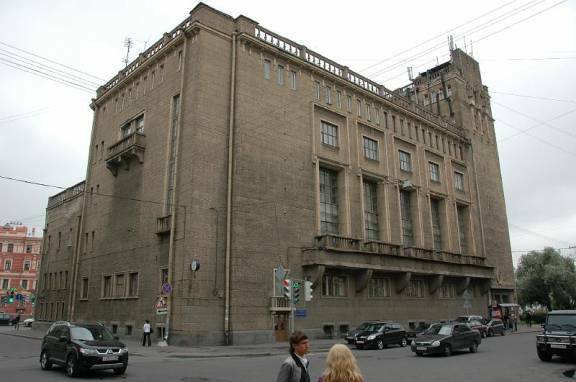 During the 20th century both tsarist sympathizers and revolutionaries whose loyalty was suspected were prisoners and often 20+ were held in a solitary-confinement cell. 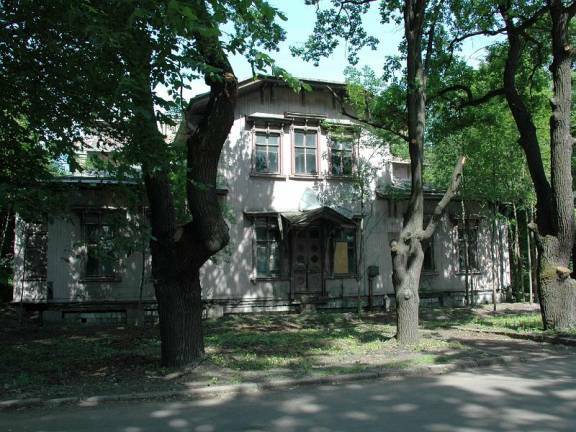 Unfortunately the Ioannovsky Ravelin Museum of Space Exploration and Rocket Technology, The Engineers’ House and the “Street of Time” were closed. 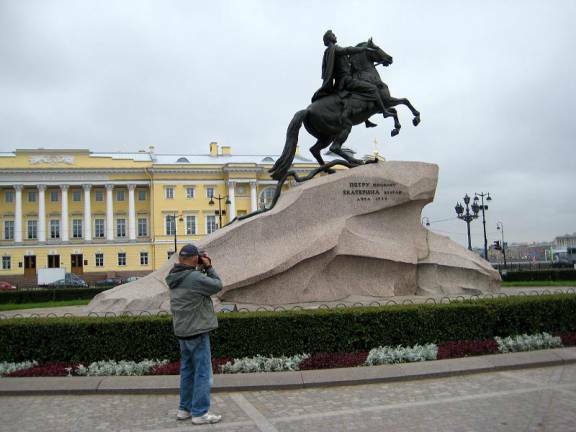 Admiralty Gardens with the famous statue of Peter the Great on horseback (Bronze Horseman), stomping a snake (Sweden). 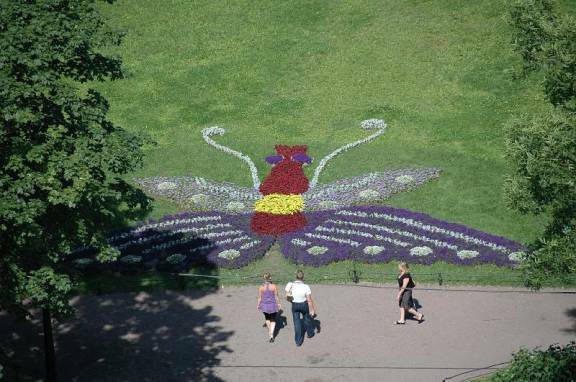 There were a series of gardens planted to resemble butterflies, which were much more dramatic from the copula of St. Isaac’s Cathedral than from ground level. 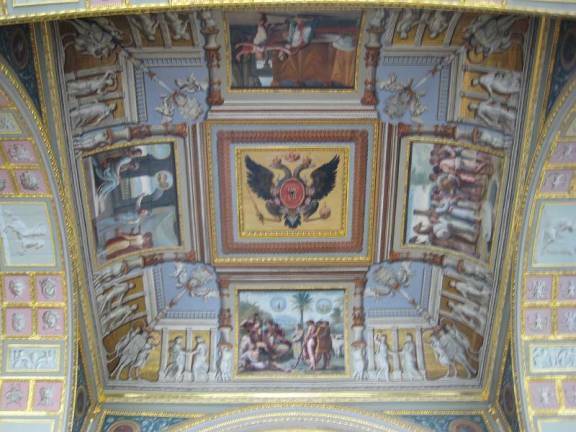 St. Isaac’s Cathedral, which was the main cathedral under the tsars. 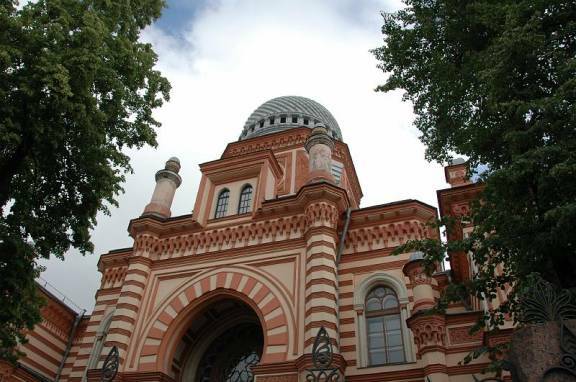 This building is substantial, with 15 different colours of marble and a beautiful cupola. 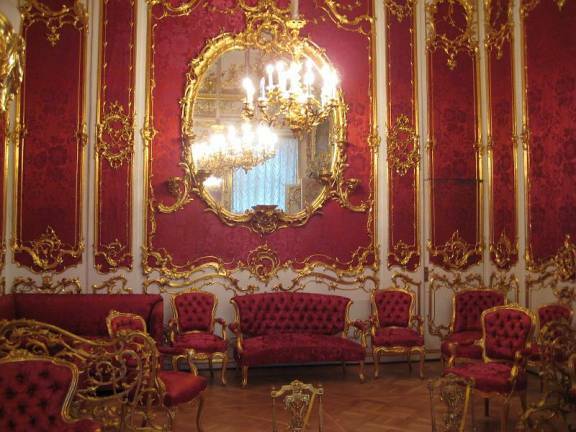 The entire inside is covered with paintings and has huge chandeliers. 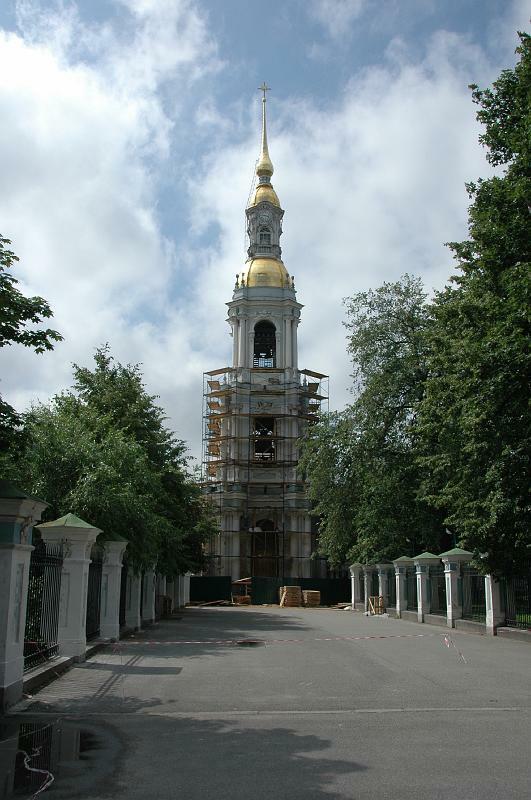 The Tsars had nothing on the Church’s ability to spend money on itself. Gives you a new view of Jesus Inc.
Now it is simply a museum. We walked up the 200+ steps to the walkway at the bottom of the cupola for some wonderful panoramic views of the city. Brian (with his vertigo) even made the trip. Grand Choral Synagogue with its 47m high cupola. Nicholas Cathedral was undergoing outside renovations, so was covered with scaffolding, but we were able to go in part of the cathedral open to tourists. This is one of the few cathedrals that was never closed during the Soviet era, and there were many local citizens lighting candles and praying in front of icons. 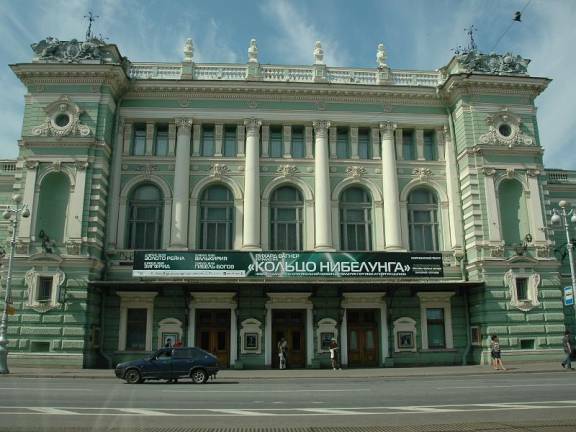 Mariinsky Theatre, and a performance of Don Quixote, music by Ludwig Minkus and choreography by Alexander Gorsky (1902). The principal dancers were great, especially Alina Somova (Kitri) and Mikhail Lobukhin (Basil), including the requisite 32 consecutive fouettés en tournant. Cathedral of our Saviour on Spilled Blood. 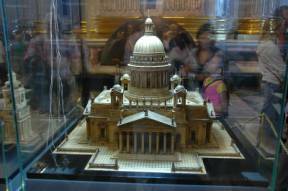 It is the multi-domed dazzling building (hardly a cathedral, but a memorial) modeled on St. Basil’s Cathedral in Moscow. The domes are covered with brightly coloured tiles, and the interior is entirely mosaics. 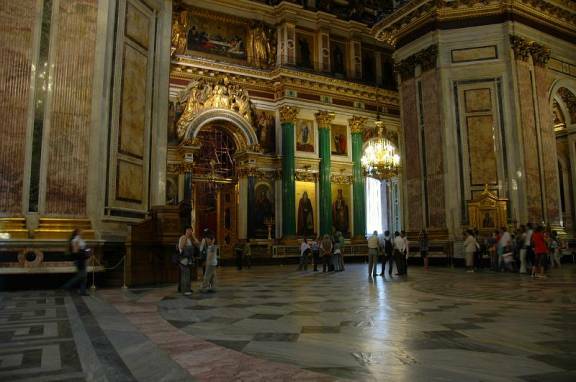 The “spilled blood” refers to the assignation of Tsar Alexander II on this spot. 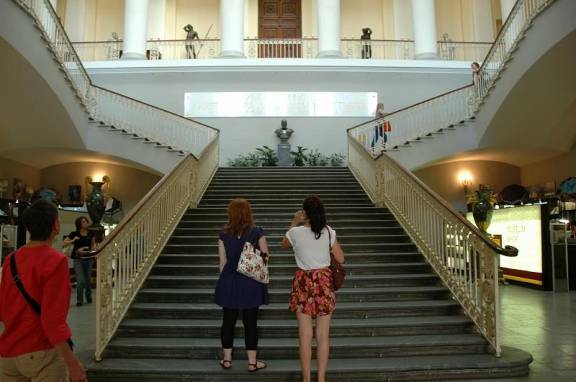 Russian Museum, housed in yet another palace, Mikhailovsky. This palace was a gift for Grand Duke Mikhail, brother of Tsars Alexander I and Nicholas I as compensation for missing out on a chance on the throne. I think he got the best deal. 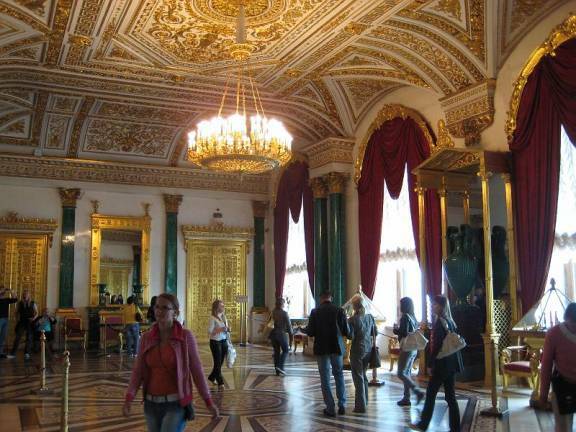 The palace interior was splendid baroque, not as much over-the-top as the Winter Palace. 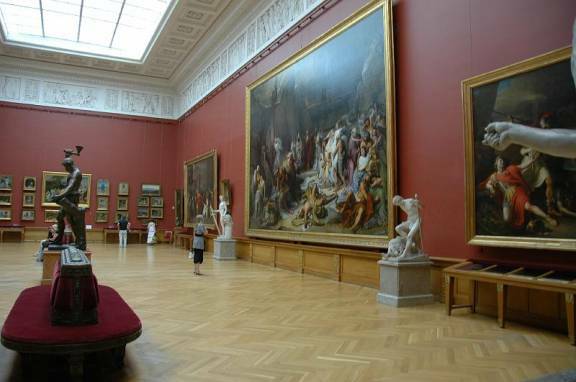 The collection in the museum was mainly Russian paintings and sculpture. It was very well presented (much better than the Hermitage) and easy to follow, but the lighting was still very poor in many rooms. 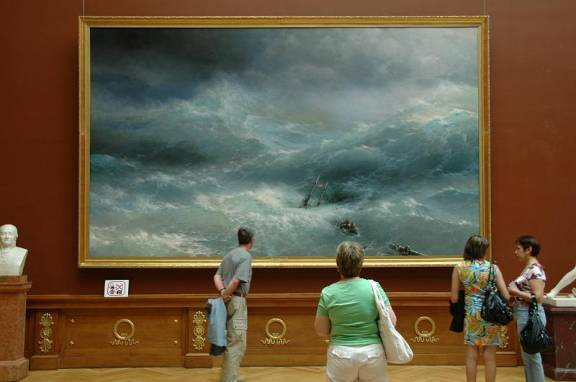 Favorite paintings were The Wave by Ivan Ayvazovsky and Cossacks Writing a Letter to the Turkish Sultan and Barge Haulers on the Volga both by Ilya Repin. 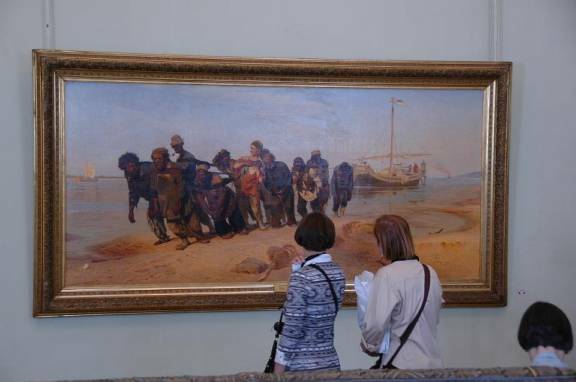 Barge Haulers on the Volga both by Ilya Repin. 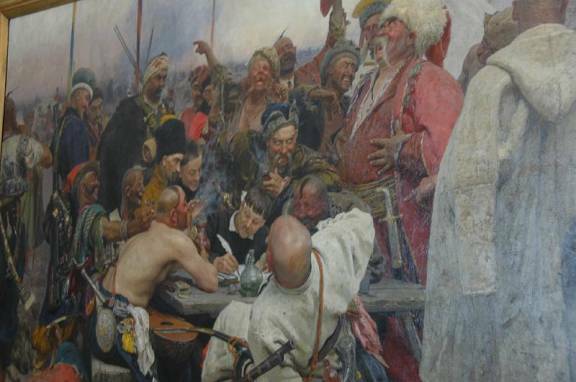 Cossacks Writing a Letter to the Turkish Sultan by Ilya Repin. 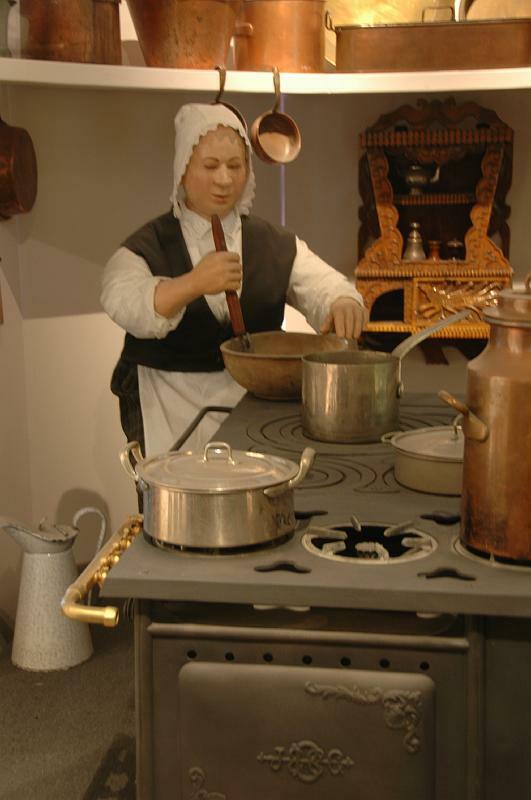 The museum also housed folk art. Jane especially enjoyed the lace and embroidery. 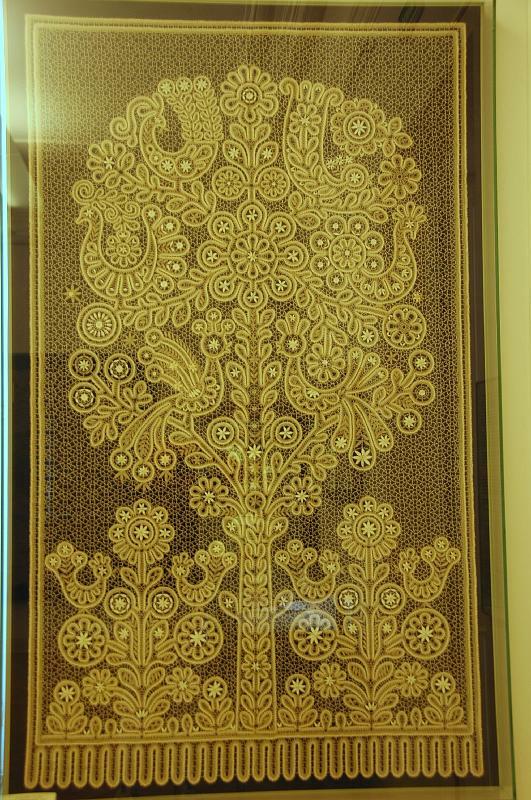 Some of the bobbin lace was from the 1940’s and 1950’s, so that skill may still exist in Russia today. 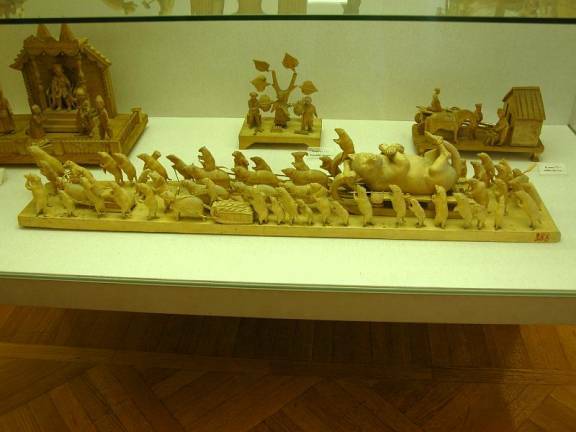 A wooden “toy” of an army of mice hauling a bound cat to his grave was enchanting in its own way.